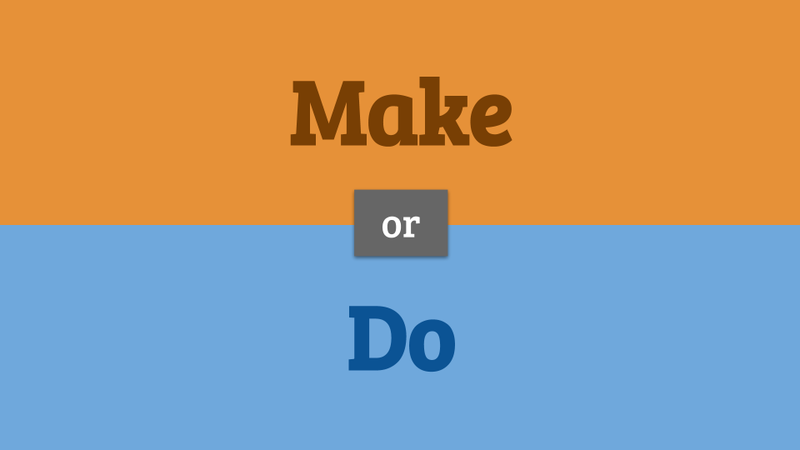 Faça a escolha correta: “make” ou “do”? I’ve made us some coffee. Existem muitas expressões fixas com ‘make‘ e ‘do‘. Infelizmente, eles não seguem nenhuma regra útil, então você precisa praticar. Várias delas são abordadas no exercício abaixo. Boa sorte! Can you _____ me a favor and lend me some money? She was late so she didn’t _____ breakfast for them. I’d love to see you soon. How about if we _____ a date for next week? We put up our tent, _____ a fire, and had a hot drink. He has to _____ his duty and look after his elderly parents. The child took a bite of the broccoli and _____ a face. Did you _____ a reservation for tonight? Finally, after being stuck in a traffic jam for an hour, we’re _____ some progress! We’ll arrive by 8pm. I’d like to _____ a confession. I was the one who ate the last of the chocolate. Please try not to _____ a noise when you come home, because I’ll be asleep. Did he _____ the doctor’s appointment yet? It’s been a pleasure _____ business with you. John _____ a lot of money in his twenties and was able to retire at the age of 35. The food took so long to arrive that Julie _____ a complaint to the manager. The professor used lots of examples to _____ his point. He _____ several errors on the report, and the boss told him to rewrite it. A famous movie star is going to _____ an appearance here tonight. Everybody’s busy, but you need to _____ time to study. Otherwise you won’t be able to get a better job. I think the café opens at six, but let’s _____ certain. I don’t want to be standing in the street waiting! I don’t think I left the gate open, but I’m just going to go and _____ sure. I have to _____ three exams and write a huge essay this term. You are going to have to _____ some changes here. I know we might not catch the plane, but let’s at least _____ an attempt to be on time. My sister is _____ well in her new job. I really hate _____ the dishes. I’m hoping to buy a dishwasher this year. Jenny certainly _____ an impression last night! All my friends are asking about her. He _____ a lot of research. David often spends Sunday afternoons _____ gardening. Going to the gym has really _____ a difference to how I feel. He was busy _____ the food shopping. The people wanted to _____ peace. The little boy spent hours _____ a drawing. The children’s favorite game is to _____ believe that they are kings and queens from long ago. Have you finished _____ your homework? Ruth spends ages _____ her hair in the morning. I have to go home and _____ some chores this afternoon. After the film, John _____ his way to a café, where he had two cups of coffee and some cake. You should eat your vegetables. They’ll _____ you good! I’ll _____ the shopping tomorrow morning. We need milk, bread, pasta and bananas. The bank robbers took £10,000 from the safe and then _____ their escape. You can _____ the dinner. I think he is trying to _____ trouble for you. The interview was very tense at the beginning, but then John _____ a joke, and after that it was much more relaxed. The children love to _____ fun of the teacher,– but only when she’s not looking. He broke into a bank, was caught by the police, and now he’s _____ time. First, I must _____ a list of all the things I need to do. His business _____ a profit from the beginning. He _____ the laundry, cleaned the house, and made dinner. John was upset because the boss _____ a negative remark about his work. She sat on the sofa, _____ a crossword and drinking tea. Lucy _____ a fortune when she sold her company. Now she doesn’t have to work. Many people _____ more than 30 mph through this town. It’s very dangerous. John has decided to _____ a course in computing this autumn. My mother _____ a comment about my shoes. I must _____ my homework before I go to bed. Okay, so we’re going to go on holiday in September. Let’s _____ some arrangements. I’ll find a hotel, and you can look at flights. I’ve bought all new winter clothes:– boots, a coat and a very warm hat. Weather, _____ your worst! She _____ so many mistakes in her essay that the teacher couldn’t understand it. Because of the snow, try not to _____ any journeys which are not absolutely essential. Hurry up and _____ a decision! He _____ the assignment, but forgot to bring it to school. I have to _____ a telephone call. Usually the children aren’t allowed to watch TV but I _____ an exception today since the weather was so horrible. My mother listens to the radio while she _____ the ironing. Hello? I’d like to _____ a credit card payment, please. Unfortunately, Lucy _____ a lot of work at the weekends. Could you call the restaurant and _____ a reservation for tonight? David is _____ plans to move to Paris. That employee is trying to _____ trouble. He is always telling the boss bad things about his colleagues. Their business _____ a loss the first year, but did much better after that. I spilt coffee on my suit and tried to clean it, but I _____ more harm than good. It looks even worse now! I’m going to go outside and _____ a phone call. It’s too noisy in here. Can you tell me how much money he _____? She didn’t _____ her best so she felt sad. Don’t worry about getting everything correct. Just _____ your best. Let’s _____ the housework quickly this morning, then we can go out for lunch. Could I _____ a suggestion? How about going out for dinner? Susie _____ a scene in the café when her order was wrong. She shouted at all the staff and demanded to speak to the manager. Could you please _____ the bed before you leave the house? Otherwise it looks so messy with the duvet and the pillows everywhere. There are so many decisions to _____. Why was Lisa late? Did she _____ an excuse? The journalist _____ a prediction about the economy, but in the end it wasn’t correct. I’ll call you this afternoon.– I need to _____ a visit to my granny this morning. She loved university and _____ lots of friends. You’re not trying hard enough! _____ an effort! Don’t _____ a sound! We need to be completely quiet. She _____ an offer on a house. She’s nervous because she’ll find out today if it has been accepted, and she really wants to buy that house. Could I _____ an observation? I don’t think some of our customers like the new adverts. I’m _____ some research for my thesis at the moment. Which job are you going to take? You need to _____ a choice. It was the first time she didn’t _____ the beds. The bride’s father often _____ a speech at her wedding. She helps homeless people and tries to _____ good. She _____ very badly on the exam, so she’ll have to retake it. She had toothache, so she _____ an appointment with the dentist for the following day. Julie likes _____ exercise, especially running. I think the students _____ a great job with this essay. It’s excellent. My friend _____ me a huge favor and lent me some money. I’ve _____ my decision. I’m going to go back to university. Jenny likes to _____ her nails each week. I’ve _____ some changes to the document. Look how late it is! Let’s _____ a move. She spends too much time _____ her hair and nails. He has to _____ the housework before he can go. There was an old man sitting on the bank of the river, _____ a painting. What a mess you’ve _____! Can’t you tidy up a bit? I’m so sorry that I upset you. How can I _____ amends? You shouldn’t sing in front of everyone! You’ll _____ a fool of yourself. It’s okay! I’m fine, it’s just a cough. Don’t _____ a fuss! I must study hard today. I _____ a promise to my mum that I wouldn’t fail any more exams. When John was last in London he _____ a discovery – a beautiful little cafe in a quiet street. Do you want chocolate or strawberry ice cream? _____ your mind up quickly! The storm has _____ a lot of damage to the house. Why does he always _____ a promise and then break it? I will _____ the dinner dishes. The children are _____ too much noise. The hero and the heroine _____ love in the film. Todas as 120 questões respondidas!